We may collect personal information from you (such as your name and email address when you use our contact form) when you use this website. You can decide not to provide us with your personal information. However, if you do not provide it, we may not be able to give you access to certain information or products. We may use your personal information to: provide you with services and information that you have requested; provide you with important notices and information about this website and our services; provide you with other information (including promotional material, news, and event information) where you agree to receive such information; verify your identity and to assist you if you forget your username or password; improve or update this website and our products; respond to your inquiries and communicate with you; and personalize this website in accordance with your preferences. This website contain hyperlinks to websites operated by third parties. We are not responsible for the content of such websites, or the manner in which those websites collect, store, use, and distribute any personal information you provide. 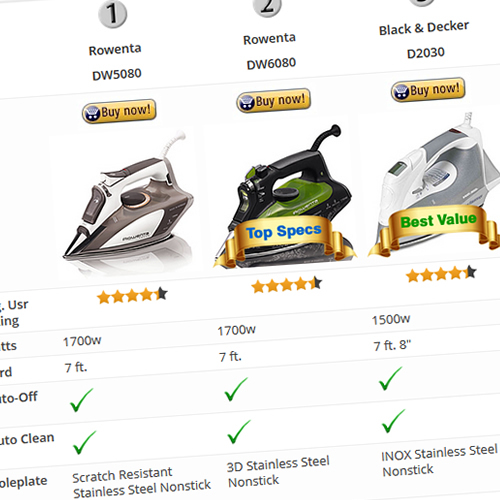 BestSteamIronsReviews.com is a participant in the Amazon Services LLC Associates Program, an affiliate advertising program designed to provide a means for sites to earn advertising fees by advertising and linking to Amazon.com.